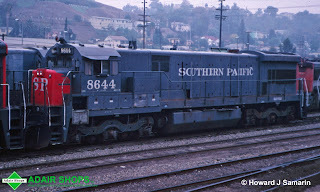 For those of us that followed the Southern Pacific, the GE U33C was as common site on trains in and out of Southern California. Assigned mostly to the Sunset route, these units racked up miles on general freight, sugar beet trains, and priority trains such as the Blue Streak Merchandiser. 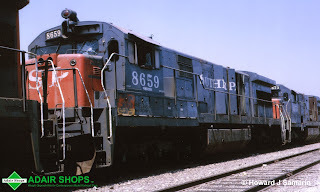 The U33C was General Electic's answer to the popular EMD SD45, which found favor with the Southern Pacific. The 16 cylinder FDL prime mover produced 3,300 horsepower to deliver 92,000 pounds of continuous tractive effort. Between January 1969 and January 1975, over 200 of these units were delivered to the Espee in several batches. 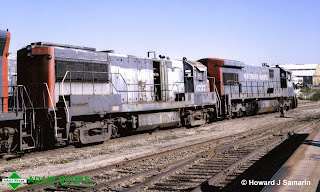 However, the GE product was more prone to maintenance and failures than the EMD counterpart, thus they were the first units put into storage during business downturns, and the last ones to come out. 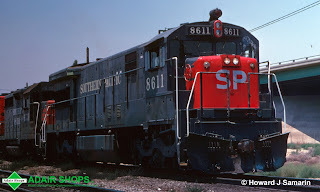 Some of the SP U33C's found a second lease on life... literally... as a batch were leased out to Mexico. 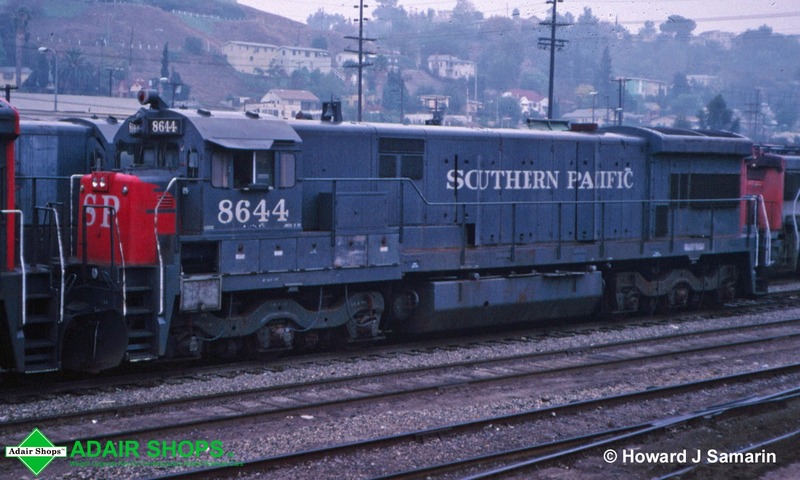 Eventually, with enough deliveries of the also popular EMD SD45T-2 and the SD40T-2, the U33C's were considered surplus, and spent their final years sitting in Bullring and Aurant Yards in the Los Angeles area. Vandals stripped the copper traction motor cables out of the units, ensuring the locomotives would not turn another revenue mile again. I remember walking the deadlines seeing cable insulation strewn along the tracks. The end finally came for the U33C's in the mid 1980's as the units were assembled into a hospital train and sent off to scrap. We hope you enjoy this look at the SP U33C's. All photos where taken and are copyrighted by Howard J. Samarin unless otherwise noted. 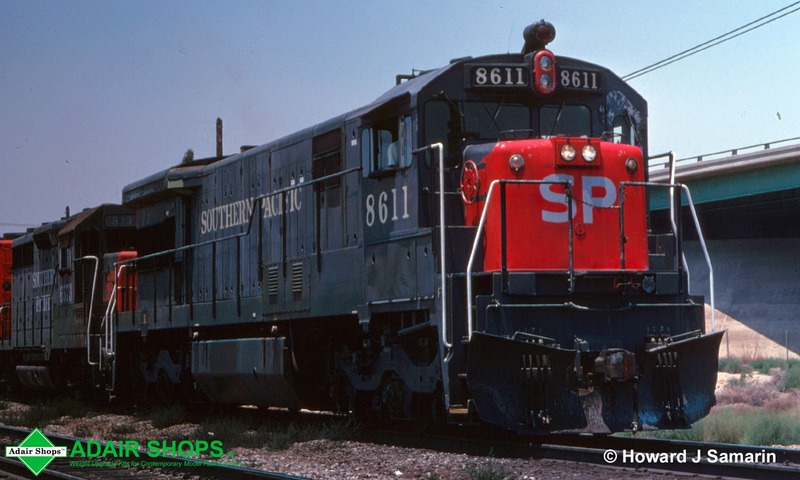 SP 8611 came from the first batch of U33C's, being built in early 1969. Notice the small taper between the carbody and the top of radiator section. This is a spotting feature of the early U33C's. Also note the standard 2 piece windshield. In later deliveries, the U33C would feature the L-shaped windshield. In June of 1976, 8611 East is about to pound over the Santa Fe mainline at Colton Crossing. 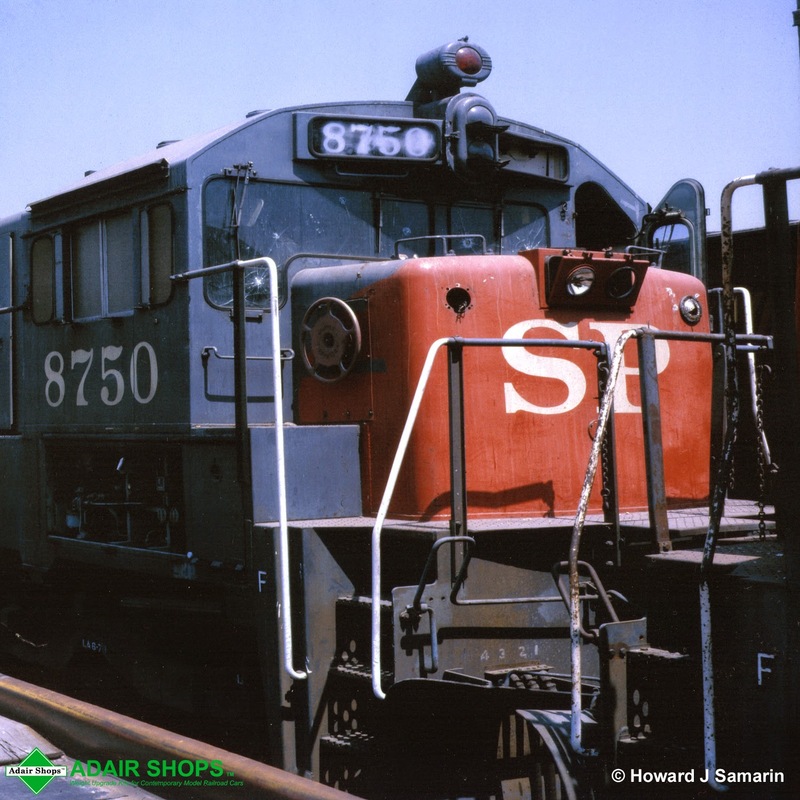 Fast forward to November 1984, 8644 is awaiting its fate at Aurant Yard, which is located a few miles away from the famous SP Taylor Yard in Los Angeles. This unit features the famous L-shape windshield, along with the SP nose lettering in a non-standard roman typeface. This unit was built in mid 1969, and features a later carbody phase. Note that the taper is missing between the carbody and the top of the radiator section. Looking well worn, 8659 sits in the deadlines at Aurant Yard with other U33C's in this June 1985 photo. This unit was built in the first half of 1970. Note the colorful battery box door. This was one of the U33C's that went down to Mexico on lease. In this April 1985 photo, 8703 is lead unit out on a string of deadline units, along fellow U25B 6737 and an unknown SD45. Given the date of this photo, the 8703, built in 1971, actually looks to be in pretty good shape. Like the U33C's, the U25B's were also common in the deadlines. Our final photo is of 8750 taken in June 1985. The end is near for this 1972 built U33C. This is also one of the units that went down to Mexico. Hello and welcome to our new blog. Over the coming months, we'll be posting articles covering a wide range of railroad and model railroad topics, in addition to news about new and existing Adair Shops products. If you have any questions or concerns about our blog, or would like to contribute content for our blog, please feel free to email us at adairshops@yousq.net. Thank you!